Betty Crocker A Piece of Cake: Easy Cakes - from Dump Cakes to Mug Cakes, Slow-Cooker Cakes and More! Organised by flavour, from chocolate to carrot, caramel to fruit, each chapter showcases a range of achievable cakes. Enjoy dump cakes, poke cakes, Bundt cakes, slow cooker cakes, mug cakes, ice cream cakes, 13x9 cakes, and more. Indulge in Chocolate Molten Lava Mug Cake or Zebra Cake from the slow cooker, both easy enough for a novice and satisfying enough for an expert cook. And to ensure things stay simple, there are helpful features, such as Genius Ways to Frost a Cake and Ingenious Cake Hacks. With both homey and show-stopping recipes, anyone can make a delicious cake, whether from scratch, a mix, or store-bought items. Everyone loves homemade cakes, but not the work to bake them. 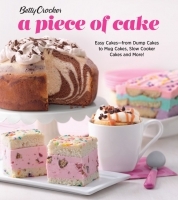 Betty Crocker solves the problem with 150 easy cakes - some so easy they never even go into the oven.